Scientists say they've discovered a new member of the human family tree, revealed by a huge trove of bones in a barely accessible, pitch-dark chamber of a cave in South Africa. The creature shows a surprising mix of human-like and more primitive characteristics -- some experts called it "bizarre" and "weird." And the discovery presents some key mysteries: How old are the bones? And how did they get into that chamber, reachable only by a complicated pathway that includes squeezing through passages as narrow as about 7 1/2 inches (17.8 centimeters)? The bones were found by a spelunker, about 30 miles (48 kilometers) northwest of Johannesburg. The site has yielded some 1,550 specimens since its discovery in 2013. The fossils represent at least 15 individuals. Researchers named the creature Homo naledi (nah-LEH-dee). That reflects the "Homo" evolutionary group, which includes modern people and our closest extinct relatives, and the word for "star" in a local language. The find was made in the Rising Star cave system. The creature, which evidently walked upright, represents a mix of traits. For example, the hands and feet look like Homo, but the shoulders and the small brain recall Homo's more ape-like ancestors, the researchers said. Lee Berger, a professor at the University of the Witwatersrand in Johannesburg who led the work, said naledi's anatomy suggest that it arose at or near the root of the Homo group, which would make the species some 2.5 million to 2.8 million years old. The discovered bones themselves may be younger, said Berger, an American. At a news conference Thursday in the Cradle of Humankind, a site near the town of Magaliesburg where the discovery was made, bones were arranged in the shape of skeleton in a glass-covered wooden case. Fragments of small skulls, an almost complete jawbone with teeth, and pieces of limbs, fingers and other bones were arrayed around the partial skeleton. Berger handed a skull reconstruction to Deputy President Cyril Ramaphosa, kissed it, as did other VIPs. Berger beamed throughout the unveiling. The researchers also announced the discovery in the journal eLife They said they were unable to determine an age for the fossils because of unusual characteristics of the site, but that they are still trying. Berger said researchers are not claiming that neledi was a direct ancestor of modern-day people, and experts unconnected to the project said they believed it was not. Rick Potts, director of the human origins program at the Smithsonian Institution's Natural History Museum, who was not involved in the discovery, said that without an age, "there's no way we can judge the evolutionary significance of this find." If the bones are about as old as the Homo group, that would argue that naledi is "a snapshot of ... the evolutionary experimentation that was going on right around the origin" of Homo, he said. If they are significantly younger, it either shows the naledi retained the primitive body characteristics much longer than any other known creature, or that it re-evolved them, he said. Eric Delson of Lehman College in New York, who also wasn't involved with the work, said his guess is that naledi fits within a known group of early Homo creatures from around 2 million year ago. Besides the age of the bones, another mystery is how they got into the difficult-to-reach area of the cave. The researchers said they suspect the naledi may have repeatedly deposited their dead in the room, but alternatively it may have been a death trap for individuals that found their own way in. "This stuff is like a Sherlock Holmes mystery," declared Bernard Wood of George Washington University in Washington, D.C., who was not involved in the study. Visitors to the cave must have created artificial light, as with a torch, Wood said. The people who did cave drawings in Europe had such technology, but nobody has suspected that mental ability in creatures with such a small brain as naledi, he said. Potts said a deliberate disposal of dead bodies is a feasible explanation, but he added it's not clear who did the disposing. 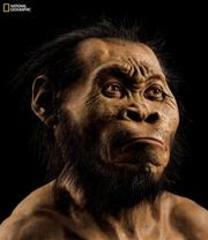 Maybe it was some human relative other than naledi, he said. Not everybody agreed that the discovery revealed a new species. Tim White of the University of California, Berkeley, called that claim questionable. "From what is presented here, (the fossils) belong to a primitive Homo erectus, a species named in the 1800s," he said in an email. At the news conference in South Africa, Berger disputed that. "Could this be the body of homo erectus? Absolutely not. It could not be erectus," Berger said.